The impact of philanthropy in Manitoba is profound. 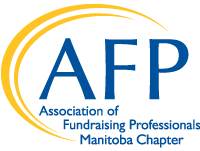 As fundraising professionals, we join together to promote thoughtful and effective philanthropy in our province. One way we demonstrate the impact of our important work is through celebrating National Philanthropy Day by presenting the Manitoba Philanthropy Awards. The wonderful stories of our recipients allow us to share the power of philanthropy to our community and to recognize them for their time, commitment and passion for their cause.